Initially I was not going to mention this, mostly since I do not want to get into a flame war with the Calvinsit bloggers. Someone sent me a link to the Alpha and Omega Ministries website, “A Lesser-Known Heretic You Should Know About.” The article concerns Joel Finck, a hyper-dispensationalist and vocal anti-Calvinist, and the Berean Bible Society as a whole. This is a good example of why I think the word heretic is overused, especially in this case. Let me preface this by saying I have a great deal of respect for the Alpha and Omega ministry, some of James White’s debates have been very productive and he has produced a massive number of resources for defending the faith. I object to the loose definition of heretic in this particular article by Jamin Hubner. Finck simply reads the Bible from a different set of presuppositions than I do, although we should both be considered “within the reformation” with respect to sola scriptura, sola fide, sola gratia, sola Christus, sola Deo gloria. Shocking as it is to my Calvinist theological world view, someone can be a raving Arminian and still hold to the five solas. We may disagree about the nature of faith, grace and the application of atonement, but we are in agreement that we are saved by the finished work of Christ on the cross. For Hubner, Finck’s rejection of baptism is more disturbing. That Finck rejects all forms of ritual baptism is enough to call him a heretic and place him in the same category as Arius or Harold Camping. This is despite the fact that Finck would agree with the whole Nicene Creed and the five solas which guide the Alpha and Omega ministry. Finck believes the only baptism that “counts” is the baptism of the Holy Spirit which occurs at salvation and he is disturbed by any ritual at all that appears to be necessary in addition to that baptism. To me, that emphasis on the Holy Spirit sounds fairly Pauline and his arguments are based on scripture, not his own visions or extra-biblical documents. In no way is Finck a cult member who relies on secret knowledge or some authoritative personality. As such, he is not a heretic, even if he is not going to be able to pastor the local Baptist or Reformed church. I have met Joel Finck a couple of times and am fairly confident he would be in complete agreement with the Alpha and Omega doctrinal statement, which is not particularly Calvinistic nor does it include baptism as a requirement for salvation. You can disagree with Finck’s conclusions on some doctrine. You can show that he is fundamentally flawed in his approach to Scripture. But you should not call him a heretic. There is little I enjoy more than a good bookstore, usually a used bookstore with nooks and crannies, someplace I can explore and find a hidden treasure. I read everyday and try to complete at least one book a week, usually I have several I am reading at any given time (professional reading, living room reading, just before bed reading, etc.) My impression has been that this is unusual, most Americans would rather watch American Idol than open a book. Yet I am always amazed at the number of people in the major chain bookstores reading. 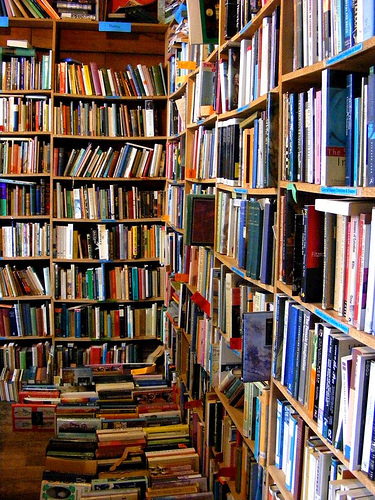 According to a report on Book Business, there are 64.2 million “avid readers” in the US. Estimated number of avid book readers—those who read five or more hours per week—ages 18 years or older in the United States, or about 28 percent of the 18-plus U.S. population. Avid readers purchase 10-plus books per year; 63 percent of them are women. Source: “2010 Survey of Book-Buying Behavior With Verso Digital,” presented at American Booksellers Association Day of Education at BookExpo America, May 2010. I think the rumors of the illiteracy of the American public are exaggerated, but I am also confident that the reading material for most Americans is lightweight at best. In fact the report goes on to say that about half of the New York Times best sellers are ghostwritten. While this does not mean they are bad books, it likely does mean they are autobiographies of pop stars and the like. I really cannot call someone that reads the Snooki bio an “avid reader.” But Americans still buy a huge number of books every year and seem to value reading, whether via a Kindle or a Real Book. Perhaps I am more concerned with the state of Christian recreational reading. Browse the shelves of any local church library, likely as not you will find quite a selection of Christian Fiction, some Christian living books (how to raise godly children, etc), a stack of donated Purpose Driven Life books, maybe some Lee Strobel style apologetic books, etc. If there is anything serious, it was left behind by a former pastor who didn’t feel like packing his whole library when the church fired him. A new book from Rob Bell will sell because the haters what to have fodder for their blogs. The major Christian publishers seem to publish two or three controversial books a year, and another twenty books answering these “heretical” views. I am not advocating an elitist view that Christians ought to only read “Classic Christian Doctrine.” If you feel the need to read the Snooki bio or the latest Stephen King novel, it is OK. But know that there are better things out there. Reading ought to be a bit like eating. Everyone knows that junk food isn’t good for you, but we eat it anyway. Some people need a “Reading Diet” — for every sugary junk-food book you read, read something that is good for you. Read a Christian Classic, read a serious Christian biography, read a book which stretches your mind a bit. Try reading a good novel even if it is not Christian. While some of the suggestions might be a bit too much for most people, a good place to start is Eugene Peterson’s Take and Read (Eerdmans, 1996). This is a great list of reading, annotated and categorized. A more popular collection is 100 Christian Books That Changed the Century by William J. Petersen and Randy Petersen. This list is also annotated, but the arrangement is by year not topic. Some books listed in this collection would not have made my list, but the point is that they were influential. What are some books which might be “healthy” reads? What are five books which every Christian ought to read? Logos has launched their new website, Vyrso. The App has been available in the AppStore for a little while (May 5, 2011), but in the last day there has been a flurry of activity and social media marketing (like this for a chance to win an iPad, etc.) I am a long-time Logos user, and I use the software on my laptop daily for lecture or sermon preparation. I have an incredibly large library amassed over the years, so when I got my iPad the first App I downloaded was Logos. The fact that my purchased books would be available on my mobile device made Logos the “killer app” which made the iPad indispensable for me. The Vyrso App appears to be nearly the same software as the Logos App. I loaded the ESV Bible and at least on the surface, the interface is identical. It is a very readable text with all of the e-book features you would expect. Like most cloud-based Apps, Vyrso works best with wireless or 3G, although books can be set to “available offline.” I think Vyrso is a bit faster than the Logos App, especially searching on text. Like the Logos App, there is no highlighting or note-taking feature. What makes Vyrso attractive to me is that it will read your Logos books. This means I already have a huge library “in the cloud” which I can read in Vyrso. For example, since I own the Anchor Bible Dictionary, I loaded into Vyrso and was able to immediately search the Dictionary. I entered Arad in the Reference Box and the article loaded in a few seconds. Highlighted text functions example like the Logos App. I can click on a linked article (Arad Ostraca), get a gloss for an abbreviation, or read a reference to the Bible in the text. References function exactly like the Logos App. I can either read the verse in a pop-up or “jump to reference” in a Bible. Again, this is all exactly like the Logos App. The search is not refined at all at this point, the hits are in somewhat random order (TDNT was first, then a series of biblical references, and then EDNT). I would rather see biblical occurrences separate from other books. I think that a “search in this book” would help as well, since I could then create a mini-concordance with the search tool. What is more, I would like to be able to set the order of books searched, something like the “keylink” feature in the desktop version of Logos. I also loaded Biblica Hebraica Stuttgartensia, with Westminster 4.2 Morphology. The text is readable, but I do not like the “each verse on a new line” look. I would much rather see the text arranged by paragraph, like the printed page. The search function is less useful in Hebrew, since lexical forms are more important for Hebrew words. For example, searching on ברא in Gen 1:1 yields good results, but the Qal Imperfect form of אמר in verse 3 does not really result in useful information. I think that these problems are simply a result of the fact that Vyrso is not intended to be an original language tool. For reading English books, Vyrso is excellent, but differs little from Logos. When the Vyrso Store launches Logos promises a huge number of books not currently available in Logos. As one of the early reviewers at the AppStore asked, “what is the point of this app”? It is a slightly lighter version of the Logos App which will be a platform for many people to access Christian books. If you are going to work with Greek and Hebrew, stick with Logos. 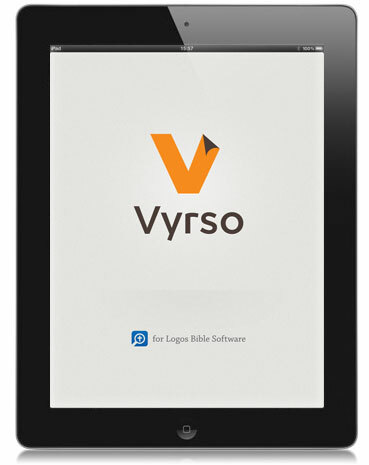 Vyrso is a good eBook reader which takes advantage of the already formidable Logos library. I look forward to seeing what the Logos will do with the Vyrso store in the future. John Piper and D. A. Carson. The Pastor as Scholar and the Scholar as Pastor: Reflections on Life and Ministry. Edited by David Mathis, Owen Strachan. Wheaton: Crossway, 2011. Paperback, 124 p. $12.99. Amazon Link. This little book is a joy to read. Recently I expressed some ideas about the need for pastors to do good exegesis as they prepare their sermons. My point that pastors have a moral responsibility to accurately present the Word of God to their congregations. This new book from Crossway asks two related questions: Can a pastor also be a scholar? Can a scholar be a pastor? As Owen Strachan says in his introduction to the book, for most of the history of the church these two categories have been synonymous. Trinity Evangelical Divinity School hosted a seminar in 2009 on the issue of the Pastor-Scholar, inviting Piper and Carson as the keynote speakers. This book is a record of their talks (sermons? papers?) at this seminar. I believe this book should be required reading for everyone training for ministry in an Evangelical Bible College or Seminary. 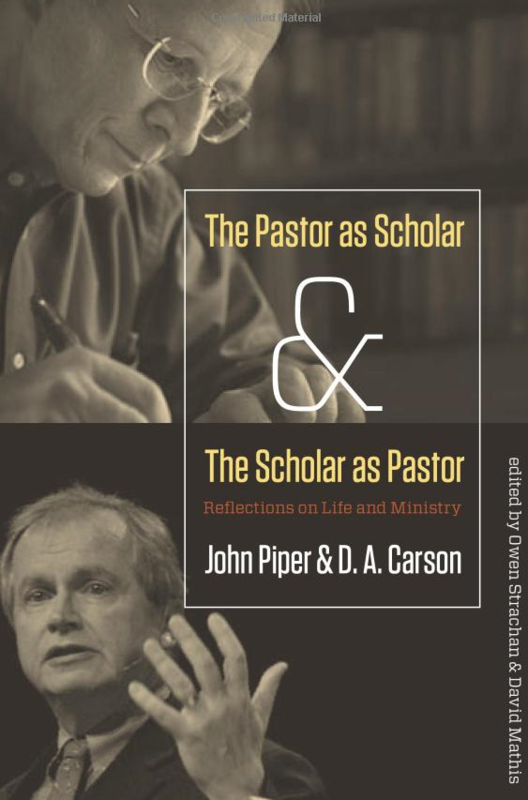 Piper and Carson provide testimony that the categories “pastor” and “scholar” not only can be combined, but that they should be a single category: the Pastor-Scholar. Piper’s chapter is a personal testimony of academic and pastoral influences from Wheaton, Fuller, and his Ph.D. studies, teaching and Bethel and eventually his ministry at Bethlehem Baptist Church. The second half of the chapter provides an excellent outline drawn from scripture which demonstrates that the believer (whether a pastor or scholar) is called to intellectual honesty as the basis for faith. If our faith is grounded in warm feelings, it is less genuine than a faith grounded in some rational reason to believe. I would add here, a faith which is grounded in warm feelings is likely to decay and die when the warm feeling goes away! Carson’s contribution is a little less autobiographical. After sharing a how he was called first into ministry, he explains his journey into teaching at a seminary. He quips at the end of this personal section that he ought to have titled his chapter “The Scholar as a (Frustrated) Pastor.” He then provides a dozen points in his chapter which serve as warnings to the cloistered academic to teach in a way which impacts the church. As a college professor and (part-time) pastor, these were especially invigorating. I see several factors which have divided the pastor from the scholar. First, scholarship has retreated to the university or seminary because people can actually make a living being scholars. Until 150 years ago, the people who “did scholarship” did not make a living from teaching and writing unless they were lucky enough to have a patron or a rare state-supported teaching position. Today someone can teach in a university or seminary and have a good living without having to work in a church as a pastor. Second, more emphasis on the pastor as shepherd has led to a false view that a good pastor needs to have “people skills” rather than scholar preparation. Since a pastor must deal with all sorts of problems, they need training in grief counseling, conflict management, time management, and the like more than they need to read the New Testament in Greek or courses in hermeneutics. I think it is true that the ideal pastor needs training in psychology, sociology, counseling and other related “human service” type fields, but to train a pastor in these skills and give them only a light survey of Bible, Theology, and Exegesis is to create life-coaches rather than true pastors. Third, there is an anti-education attitude present in the American church, especially in the more conservative forms. I meet people from time to time who think that all higher education does is kill someone’s faith. We have all heard the joke: “that pastor went to study in the cemetery, oh, I mean seminary….” (I am not sure that joke was ever funny!) Many lay-people have the impression that all the pastor needs is a Bible and the Holy Spirit. There is a certain populist appeal, but it leads to unprepared pastors doing serious damage in churches. While it is probably true that some seminaries do not create a spiritual environment which fosters the sort of development of pastoral skills I would consider appropriate, I doubt there are very many seminaries which intend to beat the faith out of their students! In the end, I think this is biblical. After all, Paul described one of the offices of the church as “Pastor-Teacher” in Ephesians 4:11. Both Jesus and Paul were able scholars in their own right, yet cared for people in ways which are models for the modern pastor. I recommend this book as an encouragement to good scholarship in the pastorate, or pastoral concern in the academy. Thanks to Crossway for sending this book my way. I would like to suggest that people be a bit more careful with the word “heretic.” Christians throw this word around as if it means “someone who disagrees with my beliefs.” After Love Wins was published, Rob Bell was vilified as a “heretic” for is nebulous view of Hell. 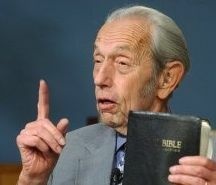 More recently Harold Camping’s prediction of the Rapture for May 21 resulting in not a charges that he was a “heretic.” In both cases the basic core beliefs of Christianity are not at stake. Rather, these two men have expressed a belief of the church in a way which is out-of-step with the norm. Bell believes in eternal punishment, just not in the same way that Calvin did. Likewise, Camping believes in the return of the Lord, just not in the same way Luther did. Do not get me wrong, I think that Christianity as properly understood from the Bible down include some sort of an eternal Hell, although I doubt it is the medieval fantasy plagiarized from Dante which most people imagine. Likewise, I do believe in a pre-tribulation Rapture, but I see no warrant in scripture to try and predict the date, nor do I feel any great compulsion to write an epic book series describe “what happens next.” My point here is that one is not a “heretic” for misunderstanding scripture on these issues. We need to reserve that word for someone who denies a core doctrine of Christianity and not use it to describe people who know how to work the media to sell books. Both Bell and Camping land within the bounds of the Nicene Creed and should not be called heretics. 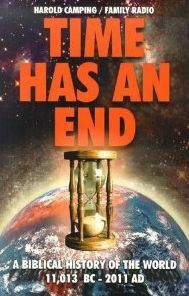 Historically, the study of Last Things, Eschatology, was among the last categories of doctrines to be developed. While I am well are that there is eschatological thinking throughout church history, it was not until the last century that biblical scholars and Christian thinkers began to develop what the return of Jesus means. This theological work is in some ways in response to Dispensational thinking, but Dispensationalism has made solid contributions to the on-going discussion. Someone like Camping stands in a grand tradition of date-setters, but these people have always been on the fringe. But being “on the fringe” is not heretical, just dangerous. I certainly think that Christianity is has suffered much from the Camping debacle. A generation ago few would have heard of Camping as the day approached, a hundred years ago there would have been very little media coverage at all. The Internet as given a platform to anyone with a strange idea. They can “publish” their ideas and gain a huge following in ways which were impossible until recently. The Internet also makes it possible to mock these sorts of ideas and make them out to be more mainstream than they are. Jokes about the apocalypse were everywhere last week – even Doonesbury got into the act. I am most disappointed that many non-Christians groups have used Camping’s prediction to paint all Christians as lunatic date-setters who look forward to the Apocalypse. The media calls Camping an “evangelical.” I suppose this is true, but I cannot image Camping reading a paper at the Evangelical Theological Society, or publishing his ideas through a major Evangelical Publishing house. To use Camping as a model of Christianity is fuzzy thinking at best, and intentionally dishonest at the worst. Camping is neither a heretic nor a paradigm of contemporary Christianity. To mis-quote The Life of Brian, there is no heretic here, just a very silly man. Our last day in Israel was a drive to the Allenby Bridge to return to Jordan. Things went smoothly until we arrived. First, the Jordanian bus was an hour late, mirroring our arrival in Israel. Second, the exit tax was higher than anticipated (I was misinformed). Aside from a little wait in the terminal things went smoothly and we were met by Salim, the driver we had for the first four days, and , a retired guide who entertained us with vaguely inaccurate versions of the story of Moses and several nominally funny jokes. We got back to the Jerusalem Inn by 1PM, so we walked down to a Jordanian mall not far from our hotel. There was a McDonald’s and a few other fast food type restaurants in the food court. I had a Sbarro style pizza, although many opted for the American-style hamburger. It is always enlightening to go into a mall in another country. You see things that are familiar, but still not quite right. I was amazed at the number of trendy stores in Jordan, including several Victoria’s Secret knock-offs. This is a window into the struggle between the young Arab who has seen the West and envies it and the traditional who has seen the West and hates it for destroying his culture. Several of us went to the Wireless Café for coffee and free wireless. I caught up on the last few blog posts I missed while in Jerusalem and enjoyed my last Turkish coffee. I also enjoyed watching a couple share a hookah for the better part of an hour. A young man and woman shared the smoke, both frequently checking their phones, but rarely talking. Again, East meets West. The flight back to Chicago was long and I was unable to sleep much. We left at 10AM Amman time and arrived at 4PM Chicago time, back to Grand Rapids by 10PM. With the time change, this made for an incredibly long day. I tried to get up fairly early and get into a normal routine on Tuesday, but that just did not happen. I plan on revising the blog posts for the whole trip (spell check on an iPad is suspect, and there are several weird word-replacements I see I need to fix), and I plan on updating the pictures to higher resolutions. I will also move the whole trip to its own page so people can read the days in order. All things considered, this was an excellent trip. My first time will always be the best, but I think I enjoy traveling to Israel more each time. My fellow-travelers were wonderful, I enjoyed their company and we all got along quite well. I am already looking forward to January 2012 for the GBC/GGF tour and May of 2013 for the next GBC Student tour.